To fit Misses’ sizes Medium (Large, X — Large). Directions are for smallest size with larger sizes in parentheses. If only one figure is given, it applies to all sizes. Finished Bust: 35 1/ 2 (381 /2, 41 1/2) in. Back Length: 21 1/2 (22, 22 3/4) in. Crochet hook in size F/5 U.S.
16 1/2 sts and 24 rows = 4 in. with Plassard BOURETTE DE SOIE and larger ndls in 5/1 ribbing. sc = single crochet: Insert hook in next stitch, yarn over, draw yarn through stitch, yarn over, draw yarn through 2 loops on hook (= 1 sc). Learn single crochet – here. Row 1: *K 5, p 1; rep from * across. Row 2: Purl. Rep Rows 1 & 2 for 5/1 ribbing. Row 1 (RS). *K 5, p 1; rep from * across, ending with k 5. Row 2: Purl. Rep Rows 1 & 2 for 5/1 ribbing, dec 1 st each edge every 6th row 5 times – 61 (67, 73) sts. Work even in est pat until piece meas 7 1/4 in. from beg. Maintaining pat, inc 1 st each edge of next row, then every foil 8th row 4 times – 71 (77, 83) sts. Work even in est pat until piece meas 13 3/4 (141/4, 141/2) in. from beg, ending with a WSR. 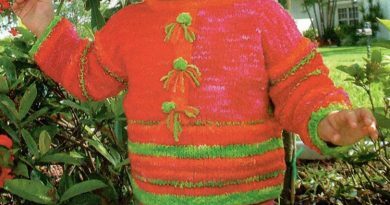 Shape armholes: Maintaining pat, BO at each armhole edge at beg of EOR: 3 sts once, 2 sts twice, then 1 st twice – 53 (59, 65) sts. Work even in est pat until piece meas 20 3/4 (21 1/2, 22 1/4 ) in. from beg, ending with a WSR. Shape neck: BO 13 (15, 17) center sts, joining another ball of yarn. Working both sides at the same time with separate balls of yarn BO 5 sts at each neck edge once. Work even in pat until piece meas 21 Vi (22, 22 3/4) in. from beg. BO rem 15(17, 19) sts for each shoulder. Row 1 (RS): K 6 (3, 6), *p 1, k 5; rep from * across. Row 2: Purl. Rep Rows 1 & 2, dec 1 st at side edge every 6th row 5 times – 31 (34, 37) sts. Work even in pat until piece meas 71/4 from beg. Maintaining pat, inc 1 st at side edge on next row, then at same edge every 8th row 4 more times – 36 (39, 42) sts. Work even in pat until piece meas 13 3/4 (141/4, 141/2) in. from beg. Shape armhole & neck: BO at arm- hole edge at beg of EOR: 3 sts once, 2 sts twice and 1 st twice; AT THE SAME TIME, when piece meas 14 3/4 (14’/4, 15) in. from beg, dec 1 st 3 sts from neck edge every 4th row 12 (13, 14) times. Work even in pat until piece meas 21 1/4 (22, 22%) in. from beg, BO rem 15 (17, 19) sts for shoulder. Work as for Right Front, rev pat and shaping. With larger ndls, CO 41 (41, 47) sts. Row 1 (RS): *K 5, p 1; rep from * to last 5 sts, end k 5. Row 2: Purl. Rep Rows 1 & 2 for 5/1 ribbing, inc 1 st each side every 4th row 4 (6, 5) times – 49 (53, 57) sts. Work even in pat until piece meas 11 3/4 in. from beg, ending with a WSR. Shape cap: Maintaining pat, BO at each edge at beg of EOR: 3 sts once, 2 sts twice, then 1 st every 4th row 6 times and 1 st EOR 4 times. BO rem 15 (19, 23) sts. Sew shoulder seams. Sew in Sleeves. Sew side seams. Left Front edging: With crochet hook, work one row sc, then 1 row reverse sc, working from left to right, along Left Front edge. Right Front edging: Work same as Left Front edging, working 5 buttonholes on first row (buttonhole = ch 2), with first one at 6 (6, 6 1/4) in. from beg and the others 2 in. apart. Row 1 (WS): *P 1, p 2 in next st; rep from * across. Row 2: K 2 in each st.
Row 3: BO all sts in purl. Sleeve edging: With RS facing and smaller ndls, PU 39 (43, 47) sts along each Sleeve edge. Work same as neck edging. Lower edge of garment: With RS facing and smaller ndls, PU 139 (151, 163) sts and work same as neck edging. Sew Sleeve seams and sew on buttons. If you want your projects to be special, you can creatе your own custom patches printed on canvas! Once you try, you’ll love them! Тhus, your clothes and accessories will be unique and different as you are! They will tell people “That’s my style and my personality!”. We decorated the current project with a patch with floral motifs. It was so pretty and easy to add to clothing. Simply apply by ironing, sew on or glue on. And the best thing is that the patches are durable and machine washable. !